ID: The URL's internal, unique ID. The handling of these URLs can be done from the Error pages tab or by adding a redirect using the Create redirect button. RSSeo! 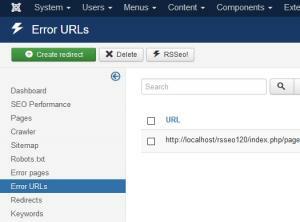 allows you to create a redirect straight from the "Error URLs" section. The configuration is straight forward: you need to select the link you need to redirect, click on the "Create redirect" button on the top left corner and complete the fields.